The Green Striped Hermit Crab (Clibanarius vittatus) is common in Tulip Shells in shallow water. This hermit crab is green with striped legs and orange antennae and attains a length of 3 inches. It is found in the waters of Virginia, the Caribbean, & the Gulf of Mexico. This is a photo of a Giant (Petrochirus Diogenes) Hermit Crab without its shell. The glove will give you an idea of the size of the creature. Pretty ugly, isn't it? The Dwarf Blue Leg Hermit Crab is a great addition to a saltwater aquarium because it eats many kinds of algae, including red slime algae (cyanobacteria), and sifts the sand, as well. Due to its size, the Anemone Hermit Crab has been known to bulldoze through just about anything in a reef tank. It is best kept in a species only tank or a large tank with large fish. It has also been ​known to capture smaller fish as they sleep at night. In the wild, the Hairy Yellow Hermit Crab (Aniculus maximus) is uncommonly found in deeper water. It inhabits large Tun, Helmet, and Triton shells. Due to its size, the Hairy Yellow Hermit Crab (Aniculus ​maximus) has been known to bulldoze through just about anything in a reef tank. It is best kept in a species only tank or a large tank with large fish. It has also been known to capture smaller fish as they sleep at night. The Blue Knee Hermit Crab (Dardanus guttatus) is found in the Indo-Pacific area in bays and lagoons. The Cone Shell Hermit Crab is common in cone shells and cowries and attains a length of about 1". The Giant Hermit Crab (Petrochirus diogenes) is found in the western Atlantic from North Caroline to Brazil. It attains a length of about 12" and is very destructive in a marine aquarium. The Dwarf Zebra (or Left-Handed) Hermit Crab (Calcinus laevimanus) may be one of the best reef tank scavengers around. Small in size (up to 1"), they can get into all of the nooks and crannies in a tank as they consume uneaten food, detritus, Green Hair Algae and even Red Slime Algae. The Blue-Eye Hermit Crab is best kept in a species only tank or a large tank with large fish. It has also been ​known to capture smaller fish as they sleep at night. The Dwarf Blue Leg Hermit Crab is a great addition to a saltwater aquarium because it eats many kinds of algae, including red slime algae (cyanobacteria) as well as sifts the sand. The Scarlet Hermit Crab (Paguristes cadenati) is a great addition to a saltwater aquarium because it eats many kinds of algae, including red slime algae (cyanobacteria), and sifts the sand, as well. Due to its size, the Anemone Hermit Crab has been known to bulldoze through just about anything in a reef tank. It is best kept in a species only tank or a large tank with large fish. It has also been known to capture smaller fish as they sleep at night. A wonderful close-up shot of this hermit that can be clumsy in a reef tank because of it's larger shell, Trizopagurus strigatus. An incredible close up shot of a Left-Handed Hermit Crab (Calcinus laevimanus), one of several Calcinus species of hermits found in Hawaii. This Hermit remains small (less than 1") and is a real workhorse, getting into all of the small nooks and crannies in a tank. This Hermit Crab is fairly common in medium-sized shells at scuba depths. It attains a size of about 3 inches and is found in Hawaii, the Marquesas, Marshall Islands. Due to its size, the Yellow Hairy Hermit has been known to bulldoze through just about anything in a reef tank. It is best kept in a species only tank or a large tank with large fish. It has also been known to capture smaller fish as they sleep at night. An incredible close up shot of a White-Spotted Hermit Crab (Dardanus megistos). 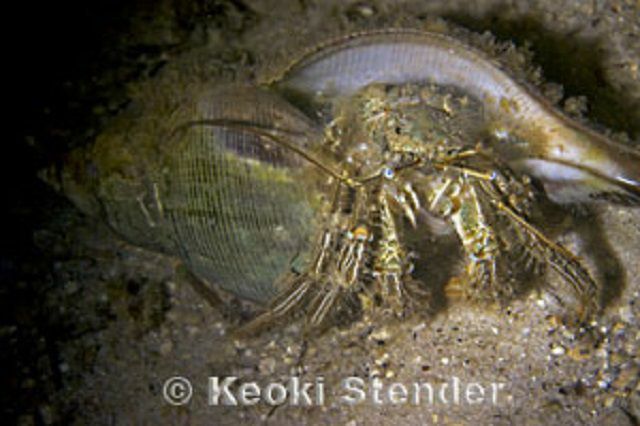 The Bloody Hermit Crab (Dardanus sanguinocarpus) is fairly common in Hawaii, Marquesas, and the Marshall Islands, inhabiting medium-sized shells. The Electric Orange Hermit Crab is a great addition to a saltwater aquarium because it eats ditritus, uneaten food and many kinds of algae, including red slime algae (cyanobacteria), and sifts the sand, as well. The Electric Orange Hermit Crab (Calcinus sp.) is commonly found in shallow and deeper water in the Indo-Pacific region. Only the Hawaiian specimens have orange bands, in other regions, they are turquoise. The Haig's Hermit Crab (Calcinus haigae) has purple legs with red spots and white tips. The Red Hairy Hermit Crab (Dardanus lagopodes) is found in the Indo-Pacific region. This photo was taken at Wakatobi, Indonesia, at 25 feet. The Hairy Yellow Hermit Crab (Aniculus maximus) is uncommonly found in deeper water. It inhabits large Tun, Helmet, and Triton shells. The Hopper's Hermit Crab (Aniculus hopperae) is an uncommon medium-sized species found only in Hawaii. It is easily distinguished by the dark brown spots at the 'elbow'. The Jeweled Anemone Hermit Crab (Dardanus gemmatus) is occasionally seen on reefs. Dardanus pedunculatus has granules covering the entire left claw. This Hermit Crab attaches two types of anemone outside of and within its shell. The anemones eject sticky acontia threads if disturbed. The Laurent's Hermit Crab (Calcinus laurentae) is Endemic to Hawaii and is common in small shells at scuba depths. It has red legs with white tips and black eyes with white dots.